Oberon and Noxious have just been updated to respectively version 1.1 and 1.6 with full support for Blamsoft’s PolyCV polyphonic CV protocol. Now you can control Oberon or Noxious with external Rack Extension devices that support this protocol and send polyphonic note commands across CV cables. If you have a doubt on what version you are working with and need support for PolyCV, just check the back panels and a visible “PolyCV” logo should be just under the gate and CV outputs in the “Sequencer Control” sections. Oberon users will also be treated with a new user wave interpolation mode that enhances the possibilities of the user drawable wave forms by providing two different new interpolation methods between the start and end waves for both Wave 1 and Wave 2. Some new cool patches are also included that demonstrate this. You should also check out this video tutorial that also gives a small presentation of the feature. On top of that 8 new Pitch CV outputs for each 8 separate audio outputs have been added to help out those of you who use Oberon in a modular setup. After exploring the front panel of the Oberon Synthesizer, now is the time to have a look at the back panel. 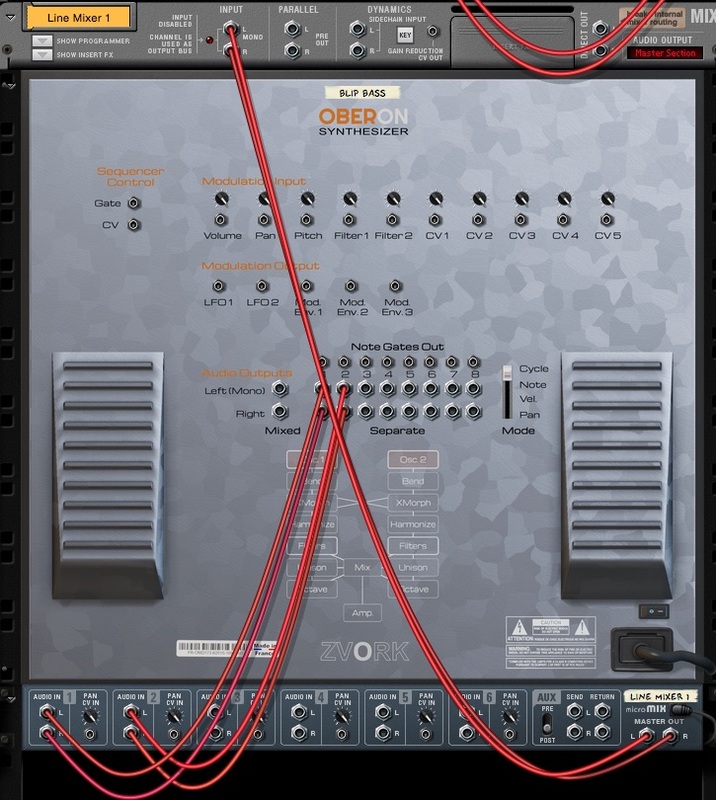 There lies a feature that can enable some creative sound construction and some interesting combinations between Oberon and other rack devices. Apart from the classic CV inputs and outputs for modulation and CV note control, you should notice right at the center a great number of audio outputs. Lets start with a new song. 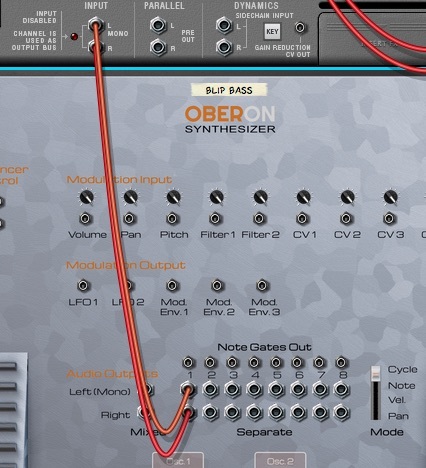 Create an Oberon device and select the “Blip Bass” patch in the “- By Category / Bass” folder of the Oberon Synthesizer patches. Now switch to the back panel with the TAB key. 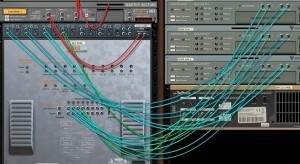 When an instrument is created in Reason, the device’s main output is automatically connected to the device’s channel mix audio input. As you can notice, Oberon’s “Mixed” audio output is connected. This is the stereo output with all the voices mixed into one single stereo stream, which is what we need 99% of the time. To the right of this mixed stereo output lie 8 stereo audio output pairs numbered from 1 to 8. Lets disconnect the mixed audio output from the canal mix and connect it back to the stereo separate output 1. If you play the patch, you can notice that there is absolutely no difference in output. You can try switching to output 1, 2, 3 or any other of the 8 separate outputs, it will make no difference. So are those separate outputs only replicates of the main mixed output? Again, if you play the patch, you shouldn’t hear a difference. But switch back to the front panel and look at the VU meters of the channel mixer’s first two channels. Notice how each time you press a different note it is a different channel that receives audio? In fact, at each key press, even if it is the same note, it alternates from one channel to another. This gets even more apparent if you connect a third separate output to the channel mixer. For instance, connect separate output 5 to the third channel mixer input. This time the output of each voice cycles through all three connected outputs. This behavior of “cycling” through the different connected separate outputs is the default output mode, but this can be changed. To the right of all the separate stereo output pairs is a vertical fader switch with four different states. By default, it is on “Cycle” which exactly what we are experiencing. Switch that to “Note” and play. Be generous and use the entire keyboard span. This time, the voices played are sent to the outputs depending on the note pressed. Low notes are sent to output 1, mid notes to output 2 and high notes to output 5. Now switch to output mode “Vel.”, for velocity and play. As the term coins, this time the voices are sent to the outputs based on their key velocity. Low velocity voices are sent to output 1, mid velocity ones are sent to output 2 and high velocity ones are sent to output 5. As you can imagine (and you can try it out for yourself), using output mode “Pan” distributes the voices to the connected separate outputs based on the stereo pan value of the notes. Lets switch back to “Cycle” mode and see what we can do with all this. With all these separate outputs we can apply effects to the Oberon Synthesizer differently for each note. Lets connect a fourth separate output to the channel mixer, for instance separate output 8. As you should understand by now, the exact separate output number doesn’t really matter as Oberon only considers the connected outputs. In between each separate Oberon audio outputs and the mixer channels, we will insert an effect device, different for each output. To put this into context, we’ve created a Matrix sequence that we have connected to Oberon. There is another feature we can use to spice up our loop. 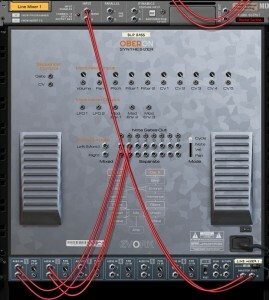 Oberon has separate audio outputs but it can also output a CV gate signal each time a note is sent to each connected separate output. This of course reacts to the current separate output mode. We can use this to our effect by applying a time varying filter that will trigger each time a note is sent to one of our separate outputs. For instance we can decide that each time a voice is sent to separate output 2, an envelope controlled filter ECF-42 is triggered on our Mixer output. Then, connect the separate output 2 gate signal (the socket is just above the audio stereo pair) to the ECF-42 “Env. Gate” input socket. The filter should trigger every four notes played. 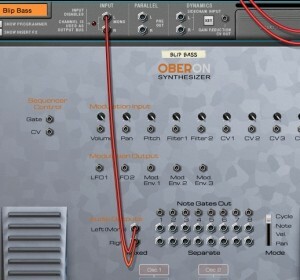 An interesting feature of the Oberon Synthesizer is the ability to morph between two spectrums. With this you can create interesting crossfades between two different sounds, for example between an inharmonic one and an harmonic one. Sometimes the result is somewhat unpredictable but it is a definitely a place for experimentation. Lets take a closer look. As said in the introduction, Oberon’s cross morph feature works with spectrums. It is not trying to morph between waveforms but between the corresponding “instantaneous” spectrums of oscillator 1 or oscillator 2. Before going into too much explanations, lets dive in and listen to what this does. Start by creating an Oberon device then reset it to a default configuration. With no surprise you should hear a classic sawtooth when playing it. Now play around with oscillator 1’s x-morph knob. Hopefuly, you should very quickly come to the conclusion that nothing changes. How frustrating. This is of course is very logical. Oscillator 1’s x-morph function lets you morph between its output spectrum and the output spectrum of oscillator 2. This works even if oscillator 2 is disabled, by the way. When Oberon is reset to its default configuration, the output spectrum of both oscillators are totally identical. They both use the same wave, with the same wave sequence position, are pitched identically and have their bend and partial clip modifiers muted (for more information on these two, check out the dedicated tutorial). As you can hear, the sound changes to metal smoothly and in a way that is different from a simple crossfade. With that in mind, lets create a patch that has a metallic attack and then fades to a triangle wave. For a reason that will become clearer near the end of the tutorial (and is purely related to the final patch we have in mind), lets use the metallic wave on oscillator 1 and the triangle wave on oscillator 2. Again, the triangle wave is by default in Wave 1 with start position set to 50%. There is a strange beating / oscillation going on in the low end. We will come to that later on but that will be our end sound. As we want the attack to be the metal sound, we need to use an envelope to modulation the x-morph position. We can use any three of them but as the first two are hard-cabled to the respective filters, lets use modulation envelope 3 for that. The default shape for this envelope is an instant attack decreasing curve, which is perfect for what we want. By default, oscillator 2’s morph feature takes oscillator 1 as a target spectrum. If we keep it that way we will morph towards the metal wave which is already what we are doing with the other oscillator. Instead, lets morph oscillator 2 to… oscillator 2! It sounds completely useless as is but is more interesting if we decide to morph oscillator 2’s spectrum to that same spectrum but transposed. Again, lets first listen to what this does. Configure oscillator 2’s x-morph section like the image below by clicking on disabling the “Osc. 1” button and turning the transpose knob to the left to the +19 semitones value. The first thing we notice is that morphing between a transposed version of the same oscillator isn’t just a simple pitch bend. Some interesting low frequency growling appear that we could take advantage of. The other thing we can notice is that even with morphing at 100%, the resulting sound isn’t completely a triangle wave transposed higher. Well, now’s the time for an explanation. By default, Oberon’s morph feature operates on the medium and high pitch partials of the spectrum, leaving the low pitch intact. This is to try to preserve the note pitch of the sound. So even at 100%, some parts of the spectrum correspond to the source spectrum while the rest are part of the destination spectrum. In between, some partials can be pitched half-way, yielding some inharmonicity. This is what we heard in our previous attempts. The numbers displayed (2, 4, 6, 8, …) indicate the harmonic rank positions. As you can see the curve rises directly to full value at where we can assume is the rank 1 (which corresponds to the note pitch, if you are now familiar with additive synthesis) position. Now that we’ve hear what x-morphing to the same oscillator does, lets use this to our advantage and link that effect to the modulation wheel. Set oscillator 2’s x-morph position knob to 0%, set the source on the modulation matrix’s second line to “Mod. Wheel”, the destination to “Osc2 – Morph. Pos.” and this time intensity to 100%. 8x Unison and Octave virtual voices per oscillator. After discovering in the last tutorial the more complex features of Oberon, today things will be lighter… and fatter. Yes, in todays modern music, we like it when sounds get fat, thick and deep. With its two oscillators, Oberon can already give you a certain amount of that by layering these two oscillators together. At the center of Oberon lies the mixer which lets you control various levels of the synthesizer, including, most of all, the output levels of both oscillators controlled by the two left-most faders. By default, and in our current bell patch, you should notice that fader 1 is at full value and fader 2 at its lowest. Sure enough, only oscillator 1 can be heard. Push up fader 2 to the maximum value and press a key. You can listen only to oscillator 2 by lowering oscillator 1’s output level to the minimum. We recognize a saw wave with a modulated low pass filter. That’s perfectly logical as we can see that oscillator 2 is using Wave 1 (which is a saw wave by default), with the start at 0%. The oscillator is also routing its output to both filters in serial, hence the modulated low pass sound. Layering oscillators is an effective way to enrich our sound. Unfortunately, it can sometimes be cumbersome to reconfigure entirely a second oscillator when you only want a slightly detuned copy of the first one. Thankfully, Oberon can generate an exact copy of each oscillator but an octave higher. This is great for fat bass sounds or rich string sections. By the way, that copy is not done through a third or fourth oscillator so it is extremely efficient on your CPU. That’s more bell-like and there is also an unexpected chorus-like effect, too. Lets keep this. You may notice when listening carefully that the attack of our bell sometimes becomes softer or slower. This seems to be somewhat random. This is due to the difference in phase between each virtual copy and the original oscillator sound. When a new note is pressed, that start phase is different for each copy. When all copies and oscillator are nearly “in phase” we have a nice attack but when they are “out of phase”, the attack becomes softer because some virtual oscillators start out by canceling each other out. This is not really problematic for slow attack sounds but for us, it’s not quite satisfying. Sure enough, the attack of our bell is now strong and clear. That sounds perfect: a nice lush consistent sound. By the way, modifying the phase for each unison partial results in change in timbre, especially on harmonic sounds and can also be used for that effect. Very, very lush but it sounds almost out of tune. We can revert back to a lower detune value but lets try an alternate route by playing around with the Unison Mix. That’s certainly better as the “out of tune” feel is really under control now but will still retain that very high lushness to our sound. To finish off this tutorial, lets crank up all these virtual copies to the maximum by putting oscillator 2’s octave level to the max and enabling an 8 voice unison on that same oscillator. How’s that for a nice lush bell sound? Manipulate oscillator spectrums with bend, harmonize and clip. In the previous tutorials we have manipulated Oberon in ways very similar to classic subtractive synthesis. For this third tutorial we will start using some features more specific to additive synthesis: bend, harmonize and partial clipping. All these features modify the spectrum of the sound at a partial level. But then again, under the hood, in additive synthesis, everything comes down to modifying the partials. First of all, let’s start with a clean sheet by creating an Oberon instance and reseting it. Set the wave start of Oscillator 1 to 50% so as to use the second shape of Wave 1. You should hear a classic unfiltered triangle wave sound. As you can maybe deduce, partial clipping has the effect of soft clipping the partial levels. In other words, it will boost low level sections of the spectrum while slightly lowering or at least maintaining high level sections. But then again, if we don’t want to delve into that much detail, we can also just see this as a “brighter” or “harsher” knob! For the moment we have just played around with spectrum levels but another nice aspect of additive synthesis is that we can also change the pitch of parts of the spectrum. Remember, additive synthesis lets us control individual portions of the spectrum through partials. This is done with Oberon with the Bend feature. As we can hear, the pitch or notes remain the same. It is just the timbre that changes to become really more metallic or glass like. That is pretty normal as the sound becomes less and less harmonic as the partial pitches are displaced from the harmonic frequencies, which is exactly what happens in bells, metal rods or very rigid strings: the frequencies produced are not harmonic. If you increase your guitar string tensions to an insane amount, apart from pitching the note up, you will also notice this effect. If you don’t want to go into much detail, you can just stop there and consider the bend modifier to be analog to a “string tension”, “metallize” or “glassify” effect. If you are more curious and power hungry, let’s dive. Again, this should look familiar now that we’ve manipulated the envelopes and wave display but a big question arises: what does that curve manipulate? First of all, let’s play around with the different curve templates on the left. A low frequency buzzing or beating can be heard, depending on the note played. That sounds like the original bend effect we started with and, as the name suggests, could correspond to an increasing string stiffness / tension. Now, what exactly is going on here? Bending has the effect of increasing or diminishing the frequency spacing between partials in your oscillator’s spectrum. Said differently, it has the effect of contracting or stretching the frequencies of parts of your spectrum. With it you can mimic physical behaviors, like increased string tension, or completely crazy unpredictable stuff. Curve points above the middle line will increase the frequency spacing and points underneath will contract it. The left start point of the curve is always the fundamental frequency of your note and that cannot be bent so as to keep your overall pitch intact. As we go towards the right side, the curve impacts higher harmonics. With all this, we can understand the bend curves better. Lets start with the first “Buzz” curve. The lower harmonics are unchanged but higher harmonics are contracted, giving the illusion of a low frequency sound, hence the buzz or beating we hear. With the “Octave” curve, we have the inverse effect. All harmonics except the fundamental have their pitch scaled up. We can’t really see it in the display but, believe me, they are scaled up by one octave. This is why the effect retains the harmonic character of the original sound. To position your bend curve points on octaves (either up or down), simply enable the “Snap Y” checkbox at the upper right of the curve display. This will have the effect of snapping your points vertically to octave positions. Finally, with the “Stiffness” curve, we can see that, as we deduced from looking at the spectrum EQ window, as we go higher up the spectrum, the partial pitches are more and more stretched upwards. This, again, replicates the harmonic distortion of a very stiff string. Ok, enough theory and curve manipulation. I don’t know what you think of this but, although it may sound realistic, there is a slight off-tune character to the patch that I don’t really like. Let’s see how we can fix this. That slightly off-tune characteristic of our patch is due to its inharmonic nature. We could counter balance this by reducing the bend but that might alter our timbre too much. Thankfully, we have a second option with the Harmonize knob. There is a slight change of timbre but much less pronounced than with altering the bend. If you are still not satisfied, we have another trick up our sleeves. By default, the harmonize feature forces back the partials to harmonic frequencies of the current note. We can instead ask to use the harmonic frequencies of the same note but one or even two octaves below. This will keep our sound harmonic but with sub-octave harmonics. Since sub-octave harmonics are closer appart (the distance between two harmonics is exactly the note frequency, remember), our harmonized oscillator will have a higher chance of sounding like the original oscillator. We have another trick with the Limit setting of our harmonize feature. By default, the harmonize works on all parts of the spectrum. But with the limit knob we can decide to limit the effect to the low end thus keeping some inharmonic partials in the high frequencies while retaining the benefit of harmonize and keep a more distinct note pitch which is essentially determined by the lower harmonics. In the previous tutorial, we explored how to define the basic timbre of an oscillator. 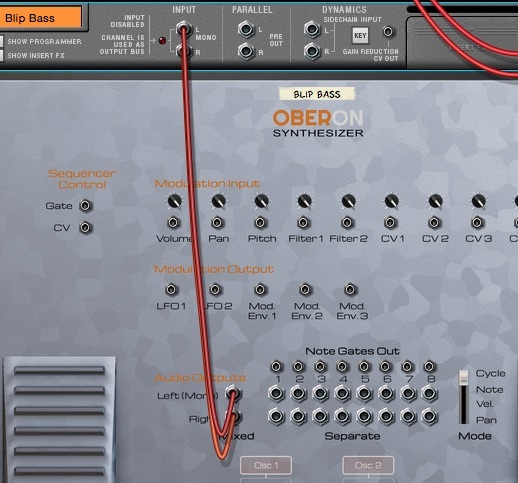 Although Oberon is an additive synthesizer at its core, it has a number of features that resemble the classic subtractive architecture that is the basis for most of the synthesizers from the very start. Most importantly, it also has filters. Filters are great to quickly sculpt your sound by removing or boosting large portions of your spectrum. Classically, a synthesizer filter consists of a low pass profile which attenuates frequencies above a certain frequency value. Modern synthesizers can switch to alternate profiles like high pass or band pass. Oberon offers two filters which are identical in nature. As we will see, each of them can alter the sound of both oscillators. But lets see how things are done in Oberon. This should be very familiar to you as this controls the cutoff frequency of the filter. By default, both filters have a low pass profile. You can verify this by pressing a key and playing around with Filter 1’s frequency parameter. In the following example, we’ve set the frequency value to a low value of around 200Hz. If you proceeded from tutorial 1, you should hear something like this, much less brighter than the sound we had at the end of tutorial 1. Just like the wave curve display, to the left are a list of envelope templates, crazy or classic, to let you quickly set your envelopes. But of course, you can also modify them by moving the points around and adding / removing them. You should notice something new, though. First of all, above the curve frame is a small “S” label. This identifies the sustain point. If you wish to modify this, just click on one of the rounded boxes above each point. In Oberon, all points before the sustain point are considered part of the attack while all points after are considered part of the release. Sure enough, we recognize the typical funky squeal sound characteristic of a high resonance value. So why call this knob “X-Y”? In Oberon, there is no such thing as “resonance”. The synthesizer uses a more broader scheme based on two filter profiles for each filter. Each filter has an X profile and a Y profile. By default, filter 1, for instance, has a low pass profile assigned to the X profile and a resonant low pass profile assigned to the Y profile. Changing the X-Y knob towards the right (towards Y) gradually morphs the final filter between this flat low pass profile to a squeaky resonant low pass profile. All this should now be familiar as you recognize a list of curve templates to the left, with the classic low pass, band pass, high pass profiles and some other more esoteric ones. Sure enough, the X filter curve which defines the X profile looks definitely like a low pass filter. The low end is at 0dB gain. Every point above it creates a gain (like a resonance), while every point underneath creates a cut (like a notch). In fact, if you are accustomed to graphical equalizers, you should feel right at home. At the center of the display, labelled “0 semi” is the cutoff frequency. Everything to the right is above the cutoff frequency and everything to the left are lower frequencies. The labels “-4 oct.” and “4 oct.” indicate that at this horizontal position, the frequency is 4 octaves lower or higher, respectively than the cutoff frequency. Now with the X-Y knob on filter 1 we can go from a normal low pass filter (approximately sounding like a 24 dB/octave filter) to a low pass filter with character. If you wish you can link the modulation wheel to the filter 1 X-Y parameter with the modulation matrix. There is another little thing we can do with filters and that is to repeat the filter response. You may have noticed this weird “Repeat” button under the filter curve to the left. Pressing this will change how the curve is applied as a filter response. When activated, the response is repeated across the frequency spectrum with a period defined by the filter frequency. For instance, if we activate repeat on our current filter setting with a filter frequency of 550 Hz, the filter curve controls the gain and attenuation of the spectrum for a 550 Hz wide band that is repeated every 550 Hz. Again, using the spectrum EQ window will makes things clearer but here is a diagram showing the differences with non repeated filter curves first then repeated filter curves. 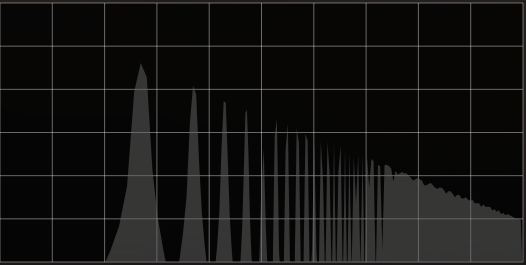 Repetitive filters like this are not uncommon in classic subtractive synthesis. Comb filters behave exactly the same way with repetitive peaks or repetitive notches. To finish off this tutorial on filters, we will take a look on how both filters are applied on oscillators. By default filter 1 & 2 are applied in sequence / serial. Pressing the button over the “Filtering” label between the oscillator and filter sections reveals a popup menu with all the available filtering modes for each oscillator. For performance reasons, it is sometimes interesting to switch to no-filtering or to a single filter only if the other has no effect. Just to be tidy, we will switch to Filter 1 Only. Hopefully the sound should remain the same! Two oscillators with identical parameters. 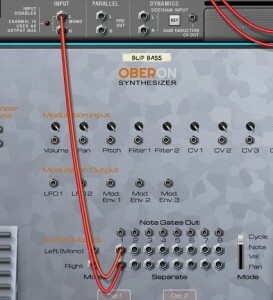 Creating a patch with the Oberon Synthesizer always starts with the oscillator section. This is where the raw sound is produced. If you are a bit familiar with basic synthesizer architectures like the ones found in the Reason stock devices Subtractor or Thor, you should feel confortable with Oberon’s oscillator section, at least for the basic settings. If not, we invite you to read a first brief Introduction to subtractive synthesis which is the heart of these architectures. First of all, lets start with a clean sheet by creating an instance of Oberon and reseting the device (right click on the device and choose “Reset Device”). For this tutorial, we will only use the first oscillator, which is the only one active by default. So no need to change anything for the moment. Lets first get rid of the obvious and very basic settings, the pitch. By default, the pitch of a sound is determined by the note of the key you press. For instance, the C4 key generates a sound at a corresponding C4 pitch, which generally corresponds to frequency around 261-262 Hz. We can transpose this by octaves using the Octave knob, lowering the pitch for negative octave values and vice versa with positive values between -4 and +4. Likewise, the Semi knob transposes the pitch by semitone increments, between +0 and +11. Finally, the Fine setting lets you do micro adjustments to the pitch by 1/100th of semitones. This is great when both of Oberon’s oscillators are activated, each one slightly detuned for that very classic fat lush sound. But lets stick to one oscillator for the moment. If you have a stereo speaker setup or, even better, headphones you should hear the above sound as a mono fully centered sound. Both oscillators in Oberon have a separate Pan and Width knob to control the placement and width in stereo space. Oscillator 1 settings are the left knobs. While the pan setting is fairly obvious, the width needs some extra explanation. Due to the nature of its audio engine, Oberon can spread the spectrum of its oscillators across the stereo field making each oscillator true stereo oscillators. This may alter the timbre slightly as parts of the spectrum will be completely to one side leaving “holes” in the spectrum on the other side. Hopefully, when the width is to the maximum, you should feel the stereo field is pretty well balanced. Ok, lets keep the width to a low level just to have a slight width by setting it between 15 and 17. Sawteeth are great but, thankfully, the Oberon oscillators can generate much more. Right at the top of the oscillator section is a display with the name of the current wave, here “Wave 1”, which corresponds to a sawtooth. The type of the wave defines the timbre of the oscillator. 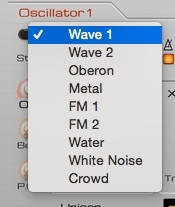 If you press the button to the left of oscillator 1’s wave type display, a popup menu appears with the list of all available waves. As we will see later on, waves 1 & 2 are a bit special. You can change the wave types and listen to the different timbres they produce. Some of them sound frankly out of tune and not very musical, especially the Metal, Water, White Noise and Crowd ones. These waves are “inharmonic” or not harmonic. It is not the sexiest sound in the world. In classic subtractive synthesizers, a wave is defined by its shape in time. By repeatedly playing that shape, the synthesizer creates a periodic musical sound with a defined pitch. The shape defines the timbre and the duration of the shape defines its pitch. By changing that shape over time, instead of repeating it but by keeping the same shape duration, a synthesizer can generated a sound of evolving timbre but of constant pitch. A wave table or wave sequence, is a sequence of shapes that defines what shape the oscillator should generate depending on a position in that sequence. That position can be static, in which case the oscillator produces repeatedly the same shape, or in movement backwards or forward, at different speed levels. In Oberon, things are slightly different due to its more generic additive engine. To each wave shape corresponds a corresponding sound spectrum. The two are completely analog and are two different ways of identifying a timbre either by looking at it in the time domain or in the spectral / frequency domain. This is even more obvious and is a nice way of working with Oberon when sound designing when you display the spectrum EQ window of Reason. You can notice, if you keep the key down, that the spectrum is static and doesn’t change over time. Oberon waves are in fact wave sequences. By default, the first “wave form” is used. “Wave form” isn’t an appropriate term in Oberon as it suggests, as in classic subtractive synthesis, that they are defined shapes that are played repeatedly. In Oberon, wave sequences are really spectrum sequences. Each entry in the sequence is a different spectrum. That may seem like not much of a difference but in fact it makes a huge difference because a spectrum may not necessarily correspond to a periodic musical sound. If you listen to the Metal or White Noise waves, for instance or even better, record them and have a look at their shape, you will notice that they do not sound musical, don’t have a really defined pitch and absolutely don’t have a periodic wave shape! 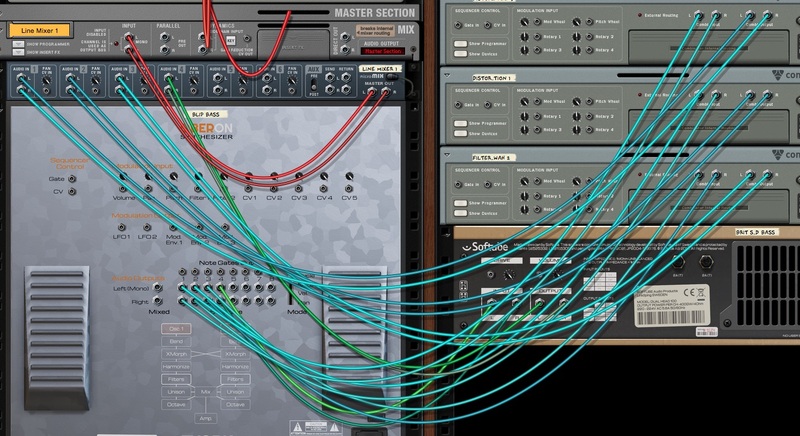 By working with spectrum sequences, Oberon can create timbres that evolve from periodic musical tones to completely metallic inharmonic ones, which is totally impossible to do with classic synthesis. The Start knob in the oscillator section defines the position in the sequence that the oscillator should use to look-up the spectrum for the timbre. Each wave type has a different number of spectrums in their sequence but all sequences loop back to the first spectrum when start is set to 100%: the spectrum at 0% is the same as 100%. Notice how the display in the spectrum EQ window changes with each change of the start parameter. While moving the start knob manually can give fun results, half of the time, we would like the sequence to play automatically. The Motion knob controls the speed of the sequence play back. When you press a key, the first spectrum played is the one indexed by the start position. Afterwards, Oberon automatically increases the position based on the motion parameter until you release the key. Of course, by default, each note has an independent sequence position but that can be changed by disabling the key sync button. This motion can be set to move forward in the sequence, or backwards but the sequence position will always loop. The motion speed is by default synced to the song tempo but again, this can be changed. Lets play our Oberon wave with a bit of forward motion. Set the start to 0% and the motion to 1/1 by turning the motion knob about half-way to the right. A motion at 1/1 indicates that the wave sequence will be looped every bar. Press our faithful C2 key and you should here an emotionally devoid robot repeatedly saying “Thisss izzzzz Oberrrr-t-on”. Or something fairly close. If you press different keys on your keyboard you should notice that the speed of the phrase remains the same while being pitched accordingly. When we first presented the wave types, we stated that Waves 1 & 2 were special. But in what way? Well, they are editable. Waves 1 & 2 are very simple wave sequences made each of two wave forms / spectrums. Since, again, every wave in Oberon loops back on its start spectrum, if you choose Wave 1 or 2 as a wave type, the first wave form of the sequence is played when the start is at 0% or 100% and the second wave form is used when the start is at 50%. You can now play around with all this and then join us for the next tutorial.